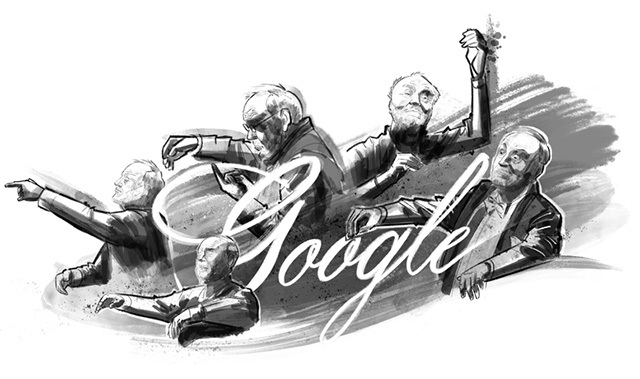 Google has a logo on their home page on their US, German, Iceland, Japan and other home pages to remember the life of one of the last old-style maestros, the German conductor Kurt Masur. He was born 91 years ago today on July 18, 1927 in Brzeg, Poland and passed on at the age of 88 on December 19, 2015 in Greenwich, Connecticut in the United States. He had three wives over his lifespan and five children. He worked as a conductor for 59 years, from 1955 to 2014, a year before he died. He worked for many years at Kapellmeister of the Gewandhaus, and also served as music director of the New York Philharmonic. Today’s Doodle celebrates Maestro Kurt Masur, world-renowned German conductor and humanitarian. Born in the Prussian town of Brieg (now in Poland), Masur studied music and trained as a pianist, organist, cellist, and percussionist in East Germany. A damaged tendon in his right hand at the age of 16 ended his playing career, but propelled Masur to concentrate on conducting. Beyond numerous musical distinctions and titles, Mazur received global cultural and humanitarian honors including Grand Officer of the Legion of Honor from the French government, New York City Cultural Ambassador, Commander Cross of Merit of the Polish Republic, Honorary Citizen of Brieg, the Leo Baeck Medal for promoting tolerance and social justice, and a Goldene Henne award for public policy work. The maestro is remembered for his belief in the power of music to “bring humanity closer together,” especially when he led the New York Philharmonic in a performance of Brahm’s German Requiem in a nationally televised memorial for the 9/11 attacks. Masur was instrumental in leading worldwide orchestras and orchestrating peace around the world. Today’s Doodle depicts the maestro’s robust conducting style, notably baton-less due to his childhood hand injury.